Food establishments within the zone will have their smoking corners removed by Dec 31 this year. Under the Smoking (Prohibition in Certain Places) Act, it is an offence to smoke or hold a lit cigarette or any other form of tobacco product which is alight or emitting smoke in a smoking-prohibited area. This is because a lit cigarette is still emitting harmful smoke, the National Environment Agency (NEA) said on Friday (Dec 28). More than 40 designated smoking areas will be located at regular intervals in the zone. 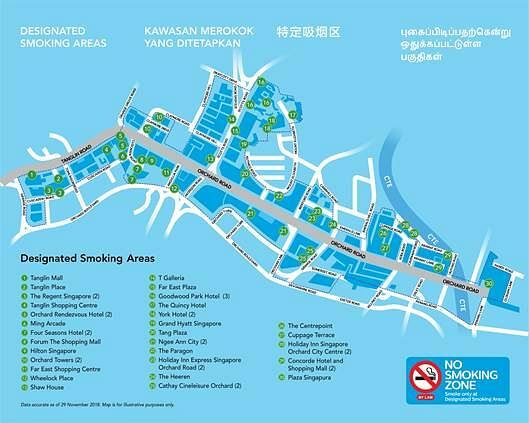 The NEA said that these designated smoking areas have been set up over the years and smokers who frequent Orchard Road should be familiar with them. Most of the designated areas are located about 100m to 200m apart from each other. The locations of the areas are available on NEA's website, as well as on the OneMap and myENV apps. Brochures listing these areas' locations will also be available at shopping malls and places selling tobacco products. The NEA also said that premise owners who wish to cater to the needs of smokers have been encouraged to demarcate designated smoking areas on their premises and put up direction signs leading to them. Operators and managers of premises where smoking is prohibited are required by law to request smokers to stop smoking, or tell them to leave the premises if they wish to continue smoking. From Jan 1 to March 31, NEA will take an "advisory approach" in the new no-smoking zone. This means that smokers found smoking in the newly prohibited public areas will receive verbal warnings or advisories from enforcement officers and volunteers. The enforcement officers and volunteers will be wearing easily identifiable no-smoking zone polo T-shirts or bright blue no-smoking zone badges, and will be deployed along the main thoroughfare of the zone. They will engage smokers and advise them to smoke within the designated areas. Their presence is in addition to the deployment of NEA's usual enforcement teams, who are in plain clothes and will identify themselves only when carrying out enforcement duties. NEA said that the advisory period is meant to "facilitate the transition for smokers". However, it added that smokers who are uncooperative may still be fined. From April 1 onwards, enforcement action will be taken against all offenders who smoke in non-designated public areas in the zone. Smokers in this group will continue to face enforcement actions, said the NEA. The NEA said surveillance cameras will be selectively deployed to monitor certain hot spots and other areas in the zone based on feedback. The NEA added that it will monitor levels of compliance with the zone's regulations and step up its enforcement presence where necessary. Efforts to increase the public's awareness of the new zone have also been stepped up. Signs will be placed on bins and some lamp posts within the zone, and advertisements will be put up at Orchard, Somerset, Newton and Dhoby Ghaut MRT stations, selected bus stops and on buses that ply Orchard Road. To keep foreign visitors and inbound travellers informed of the zone, informational materials will be displayed from Jan 1 at Singapore's points of entry such as Changi Airport, Singapore Cruise Centre and Marina Bay Cruise Centre.